Most people do not know about the subclavius muscle, but it can be the source of pain in the area of your biceps brachii, your inner forearm or your first three fingers. 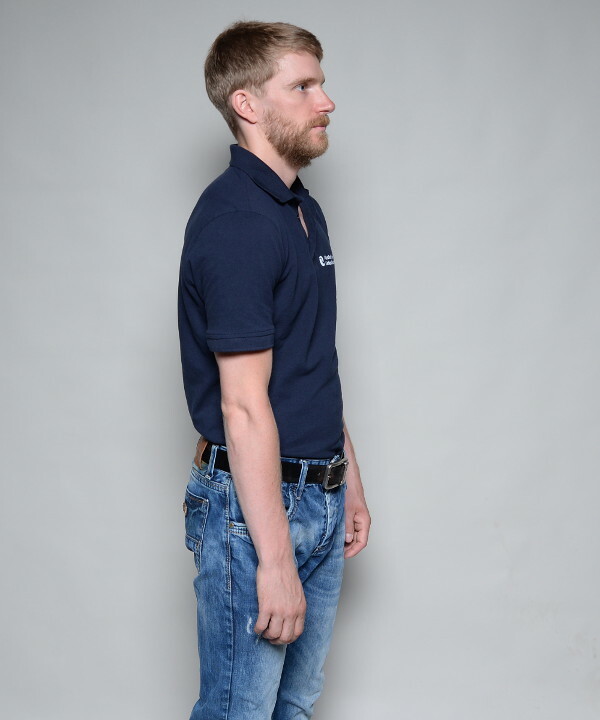 If you have a rounded back posture or if you are working a lot on your desk – writing and reading – the chances are good that this muscle is tight or even contains tender or trigger points. 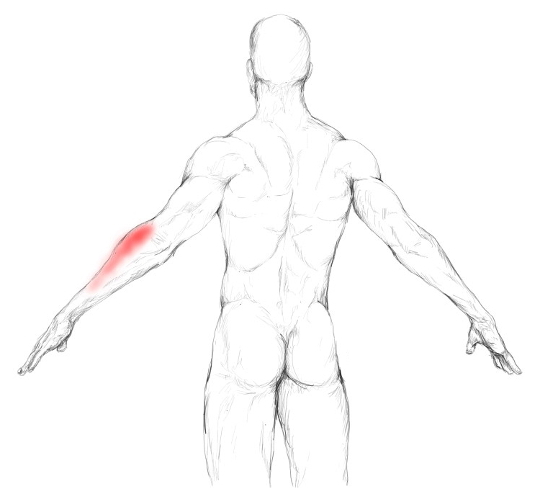 With trigger points in this muscle, you might feel pain all the way down your arm. It may even radiate into your thumb and first two fingers. 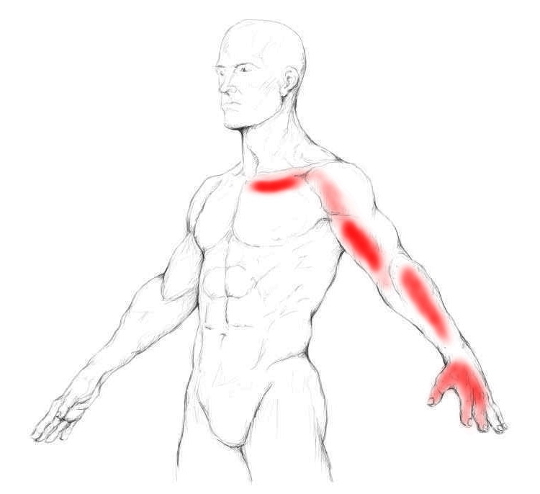 The darker the red in the picture below, the more common it is to feel pain in the respective area when trigger points are present in this muscle. Hence, this muscle can, among others, contribute to the following pain symptoms. Click on the just placed links to learn how you can relieve the corresponding pain. I know of no activities that may be impaired with this muscle being too tight. Still, it might leave you with a tight feeling in your chest and may impair your shoulder flexibility. It connects the outer and underside of your collarbone with your first rib. On the one hand this muscle helps to stabilize the joint that is formed by your breast bone and the collarbone, called the sterno clavicular joint. Furthermore, when it contracts, it brings the collarbone and the first rib closer together. By doing so it helps or assists a protraction – forward shift – of your shoulder. 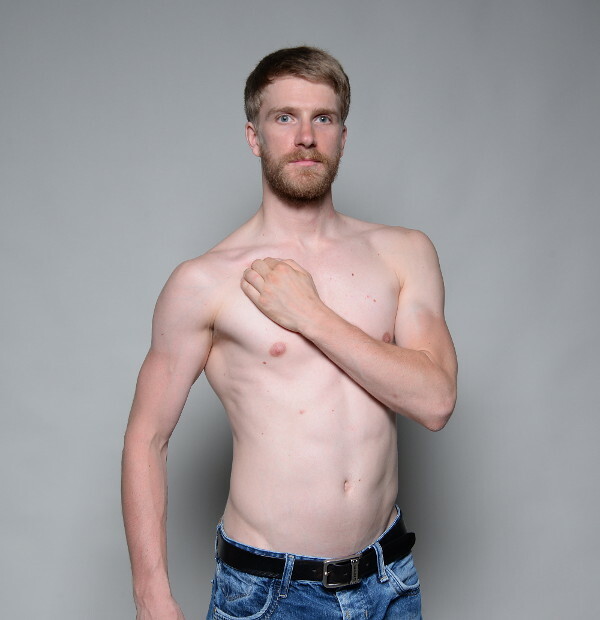 As the subclavius muscle is not exerting or initiating really big movements, there are none of such that are common to overstress it. But a round back brings the muscle in a shortened position. Over time this can make the muscle tighten up and eventually developing tender and trigger points. The subclavius muscle lies directly under your collarbone and your pectoralis major muscle. This makes it a little tricky to sense. But if you bring your arm close to your body and rotate it inwards, you may be able to feel it with your fingers underneath your collarbone. If not, do not get upset or stress yourself. For this muscle it is not too important to feel it as long as you know where to place the massage equipment. Note: In the picture I just have my hand on the muscle. My shoulder is NOT rotated medially. This is a medial rotation. For self-massage you can use your hands or the Trigger Fairy. I always recommend using a self-massage tool whenever possible in order to save the hands from strain. Massaging the subclavius muscle will obviously lead to a simultaneous massage of the upper part of your pectoralis major. This is no problem at all as most people I know of would benefit from massaging their chest. With the Fairy you can execute precise massage strokes or the pressure-motion technique. Place the Fairy on the muscle, directly under your collarbone. Now search for tender spots and massage them with horizontally massage strokes. Make sure to only move the skin and not to slide over it. Again, place the Fairy on the muscle. Only hold it with one hand. 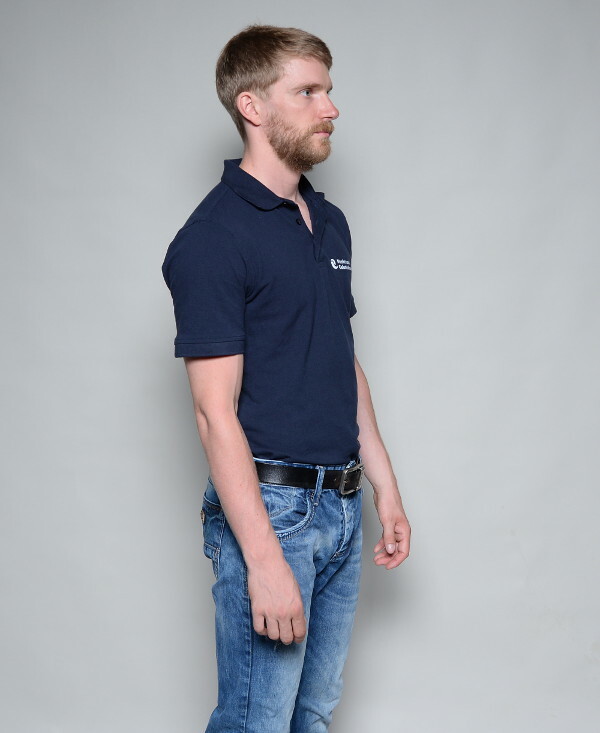 While exerting pressure, slightly move your shoulder backwards repetitively. Place the fingers of the opposite hand on the muscle. Use your fingertips to pressurize the muscle and search for tender spots all the way along your collarbone. Massage each of them with slow and short massage strokes by pulling skin over the muscle. Usually you encounter the most painful spots towards your sternum and chestbone, respectively. If you lift your arm 90° and rotate your shoulder medially, you will “loosen” some fibers of the pectoralis major, which lies over the subclavius. Thus you will have easier access to the muscle. But there is also a disadvantage, which is that you cannot use your free hand to support your massaging hand. This means you put more stress on your fingers. Still, in this position you can use the Trigger Fairy, too. This way you get rid of this disadvantage.